I went to Bravo Pizza a few weeks ago. The pizza was delicious but the service was really not up to par. The store itself is pretty small. The staff was very friendly and nice, but unfortunately a little slow and unable to handle the crowd. I don't think this store is set up for quick service. Most people in the city want to just quickly grab a slice of pizza and get back to work. I happen to have gone on a Sunday, when I was relaxed but we had a very large group. While we had all the time in the world, the children were very anxious to get their food. When it did finally arrive it was, as I said, delicious. The crust was soft, and the pizza had amazing sauce. The calzones also got rave reviews. I personally appreciate any pizza store that still serves fountain soda. Even though I knew it's really the cheaper option and definitely more cost-effective for them, I really enjoy sipping from that classic cup. Unfortunately for me and my children, they ran out of french fries before we arrived. That was very disappointing. I mean, what pizza store does not have french fries? Would I go back? Does Bravo Pizza hold up against (the former) J2? I think the answer lies in the facility and service. 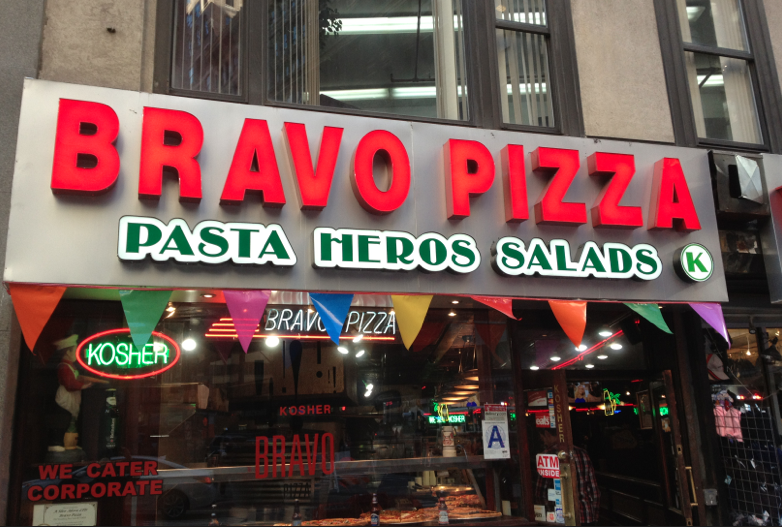 Even though Bravo might have the better pizza, it's too small and understaffed to really hold the crowds that J2 used to handle each day, and now still have the space to handle in their new location on W35t st. Hopefully, both pizza stores can be successful as I definitely see promise in Bravo. The food was outstanding and I just hope that they can maintain a higher level of service that kosher families and midtown businessmen expect.